At its recent 2018 awards ceremony, Main Street Delaware honored several people, organizations, and businesses for their service to the downtown and the community. Main Street Delaware recently honored several businesses, organizations, and individuals with 2018 awards for the positive impact they have made on the historic downtown and local community. Main Street Delaware handed out 11 awards at its Oct. 30 recognition ceremony, held at Ohio Wesleyan University’s Richard M. Ross Art Museum. 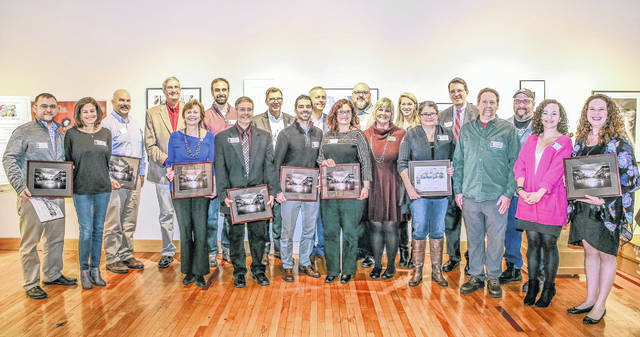 • Community Partner Award – Performance Chrysler Jeep Dodge Ram Delaware for a commitment to the downtown and community that includes sponsoring every First Friday celebration for the past two years. Accepting the award were Bruce Daniels and Denny Friermood. • Best Public/Private Partnership – Ohio Wesleyan, Delaware County, and the City of Delaware for the creation of The Delaware Entrepreneurial Center at Ohio Wesleyan University. The new facility, which opened in October, is a business accelerator and education center committed to improving the local economy and providing internships and learning opportunities for Ohio Wesleyan students. Accepting the award were OWU’s President Rock Jones and Megan Ellis, administrative director of The Woltemade Center for Economics, Business, and Entrepreneurship; County Commissioner Barb Lewis; and Assistant City Manager Jackie Walker. • Best Commercial Rehabilitation Award – The Oak & Brazen Wine Company. Owner Jeff Kirby was honored for overseeing efforts to transform an empty, neglected building into a beautiful, cozy venue that is quickly becoming a vibrant mainstay of the downtown. • Best Public Building Rehabilitation – Delaware County for its $39.2 million, 94,450-square-foot Courthouse building project that now houses the Court of Common Pleas, Domestic Relations Court, and Clerk of Courts, as well as offices for probation officers and public defenders. The award was accepted by Commissioner Lewis and Facilities Director Jon Melvin. • Best Upper Floor Residential Rehabilitation Award – Denny Bolton and Kreg King for their work to transform the upper floor of 42 N. Sandusky Street, future home of Bolton Insurance. • Spirit of Main Street Award – Nicole Fowles for her ongoing work to support Main Street Delaware and improve the downtown. Fowles is a former president of the Main Street Delaware Board of Directors and current member of its Organization Committee. Her many contributions are highlighted by her work to help create the Merchants and Muffins meetings and the Home for the Holidays weekend, now in its second year. • Business of the Year Award – The Greater Gouda for its deep commitment to Main Street Delaware and the community. Owners Terri and Mark Smiles and all of their employees are involved with Main Street projects and committees, including Promotions and Christmas committee activities. The Greater Gouda’s efforts helped Main Street to earn the Heritage Ohio Award for Best Committee Event with Home for the Holidays 2017. Accepting the Business of the Year Award were Terri and Mark Smiles, Josh Keefer and Liz Moser. • Volunteer of the Year Award – Ashli Nixon for her many hours of work to help Main Street Delaware create and launch its new website, and her ongoing work to help keep the site updated with fresh images and informative news. • Outstanding Leader Award – Cole Hatcher for his ongoing work to support Main Street Delaware, including more than a decade of service as both an elected and Ohio Wesleyan-appointed member of the Main Street Board of Directors. Hatcher is currently a member of Main Street’s Organization Committee. He is a former chair of the Promotions Committee and former board vice president and secretary. • Preservation Hero Award – Roger Koch in recognition of his more than 40 year as a historic preservation champion in Central Ohio and, especially, Delaware. Koch has helped to secure inclusion on the National Register of Historic Places for 79 downtown Delaware structures and 510 Northwest Neighborhood buildings. In the 1990s, he purchased and renovated several downtown buildings, seeking tenants who would contribute to the vitality of downtown and, later, historically-minded buyers. Koch served on the City of Delaware’s Historic Preservation Commission from 2002 through 2017 and has been active with Main Street Delaware since its inception. • Business Beacon Award – Fresh Start Café and Bakery and owners Todd and Leigh Daughenbaugh for their work to draw new media attention to downtown Delaware with “Experience Delaware,” a daylong tour of downtown businesses for more than 40 Central Ohio lifestyle and food bloggers, complete with goodie bags, lunch at various local restaurants, demonstrations throughout the day, and time to explore. The 2018 awards ceremony was sponsored by TRIAD Architects and 2K General Company Inc. To learn more about Main Street Delaware and its upcoming events and volunteer opportunities, visit www.mainstreetdelaware.com or www.facebook.com/MainStreetDelaware. Main Street Delaware is a 501(c)(3) member-supported organization. In addition to coordinating the First Friday celebrations and downtown Farmers’ Markets, Main Street Delaware oversees the holiday parade, Christmas tree lighting, and more. Main Street Delaware is an accredited Ohio Main Street Community. For additional information, contact Susie Bibler, executive director, at 740-362-6050 or director@mainstreetdelaware.com. Learn more at www.mainstreetdelaware.com or www.facebook.com/MainStreetDelaware.